Nails Inc master class, Swansea, April 4th & 5th 2014. 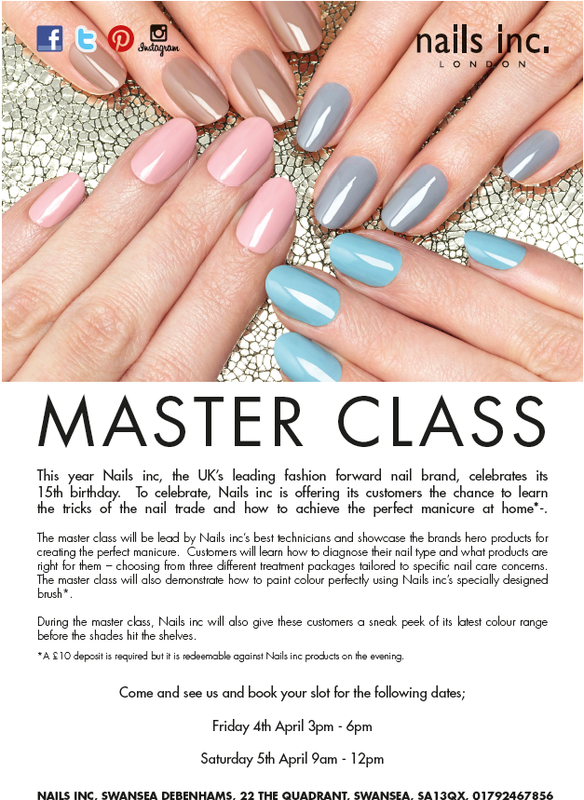 Nails Inc has a master class of their products on Friday the 4th of April and Saturday 5th of April! There are two days or times you could attend, which is between 3pm-6pm on the 4/4/14, and 9am-12pm on 5/4/14. You can learn about what polishes and treatment products are suitable for your nails, their Hero products, as well as a workshop learning how to apply the perfect polish, and the secret to their specially designed brush. Sadly I won’t be able to attend, but I hope you can take advantage of this class! Be sure to grab a Caviar top coat or nail treatment with your £10 redeemable deposit! Click the picture to see all information regarding this event. Posted on April 1, 2014 January 3, 2015 by sindyydollPosted in In and Around Cardiff, Local and National Events, Nails, Nails INC, Press EventsTagged bblog, bblogger, bblogger event, blogger event, event, Hero products, master class, Nails inc, nails inc event, nailsinc, swansea, swansea nails inc, treatment products, welsh event. Previous Previous post: Mini Review Barry M Silk Nail Effects Polish – SKNP1 Blossom ! Next Next post: LGFB + Benefit Blogger event, with Gimmie Brow and Big Easy!